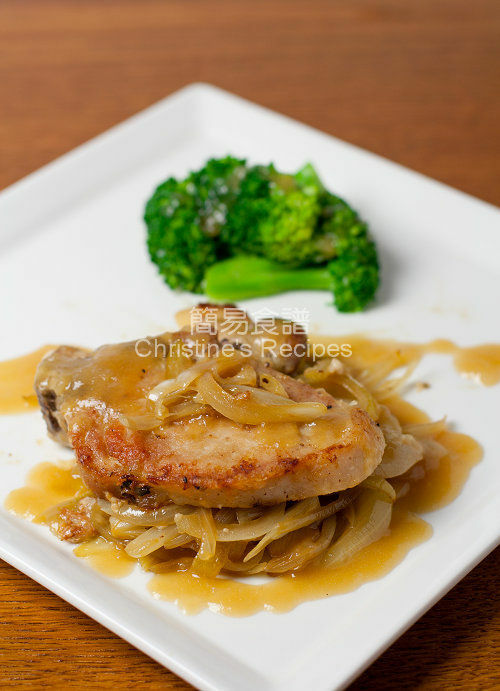 Caramelized onion and pork chops are wonderful partners. If you haven’t tried it before, do give it a go. You’ll know how fantastic the taste is. Making caramelized onion is quite simple, just need a bit of patience and time. After baking, the pork chops become tremendously tender and juicy. Rinse the pork chops and wipe dry with towel papers. Pound the pork chops with the back of a knife cleaver or a meat tenderizer. Season with sea salt and pepper on both sides. Lightly coat with plain flour. Set aside. Preheat oven to 180C (350F). Line a deep baking tin and grease some oil on the surface if necessary. Heat 2 tablespoons of oil in a frying pan. 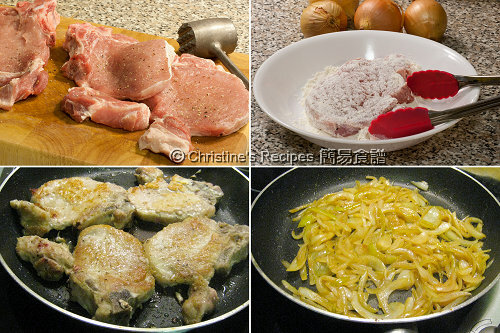 Pan fry the pork chops over medium-high heat until both sides are lightly brown. Transfer into the lined baking tin. Cover with foil. Bake for about 20 minutes. Heat 1 tablespoon of oil and butter in the frying pan. Add the onion, sauté over medium-low heat until softened. Season with salt and pepper. Stir in the brown sugar. Continue to cook until the onion turns dark and really soft. If you find the onion is too dry while cooking, you might need to add some water, about 1 tablespoon at a time. Don’t add too much water in one go. Remove the pork chops from the oven. Place the onion on the top of pork chops. Pour in the chicken stock. Cover with foil again. Put them back into the oven and continue to bake for another 15 to 20 minutes. Let the pork chops absorb all the flavours. When the pork chops is ready, place on a serving platter. Strain out the onion and pour the sauce into a small saucepan. Bring it to boil, add the thickening and cook to preferred consistency. 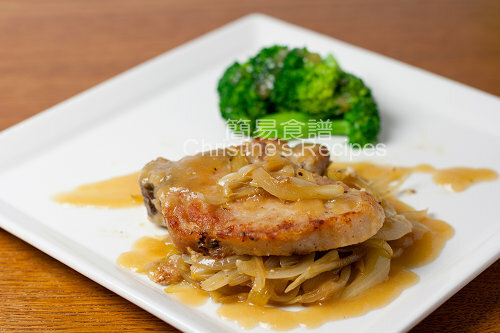 To serve, top the pork chops with onion, ladle the sauce over the pork. This has such a homey feel! Kinda reminded me of Hainanese pork chops too. I really love your recipe, I will try this at home thank you so much for such a wonderful recipe. I love it!!.. I love onion and this looks so good to eat. Yum! I love onions and pork chops! Looks delicious! delicious and would love to have some! That looks so yum! I love caramelised onions on many meats. Love this simple and homey food! What a yummy western meal! Yum, yum .... this is a goody one-dish meal. That looks like something I could actually do! -And I have all of the ingredients. I never really cook pork chops, so the hubby will be impressed! Thanks. Do I line the baking pan with foil? Yes, line with foil. Or you can grease it. Hi Christine, can I replace the chicken stock with something else? Not sure how to prepare stock the easiest way. The easiest way is to use the store-bought chicken stock from supermarkets.